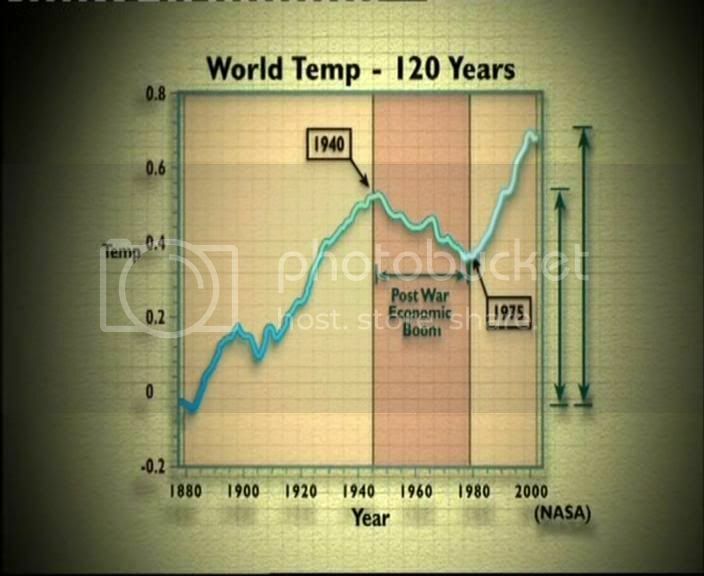 CO2 doesn’t match the temperature record over the 20th C. True but not relevant, because it isn’t supposed to. 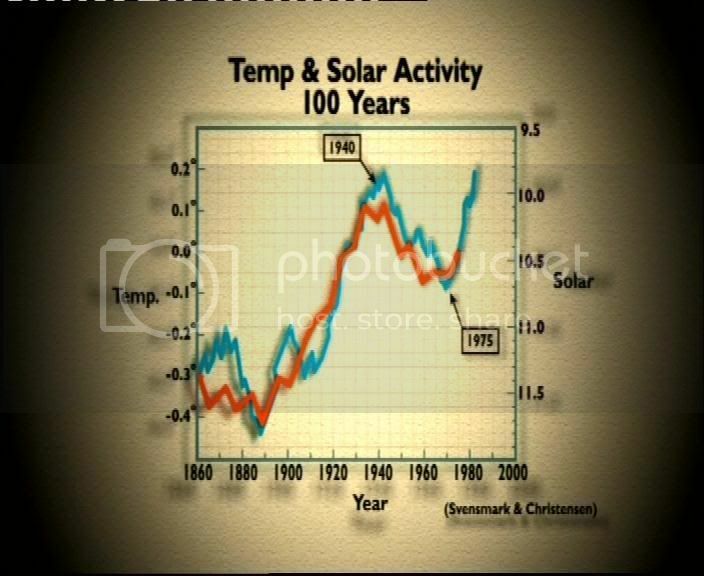 The programme spent a long time agonising over what they presented as a sharp temperature fall for 4 decades from 1940 to 1980 (incidentally their graph looks rather odd and may have been carefully selected; on a more usual (and sourced!) plot the “4 decades of cooling” is rather less evident). They presented this as a major flaw in the theory, which is deeply deceptive, because as they and their interviewees must know, the 40-70 cooling type period is readily explained, in that the GCMs are quite happy to reproduce it, as largely caused by sulphate aerosols. See this for a wiki-pic, for example; or (all together now) the IPCC TAR SPM fig 4; or more up-to-date AR4 fig 4. So… they are lying to us by omission. The troposphere should warm faster than the sfc, say the models and basic theory. As indeed it does – unless you’re wedded to the multiply-corrected Spencer+Christy version of the MSU series. Christy (naturally enough) features in this section, though he seems to have forgotten the US CCSP report, and the executive summary which he authored says Previously reported discrepancies between the amount of warming near the surface and higher in the atmosphere have been used to challenge the reliability of climate models and the reality of human induced global warming. Specifically, surface data showed substantial global-average warming, while early versions of satellite and radiosonde data showed little or no warming above the surface. This significant discrepancy no longer exists because errors in the satellite and radiosonde data have been identified and corrected. New data sets have also been developed that do not show such discrepancies. See-also previous RC posts. All the previous parts of the programme were leading up to “so if it isn’t CO2, what is it?” to which their answer is “solar”. The section was curiously weak, and largely lead by pictures of people on beaches. It was somewhat surprising that they didn’t feature Svensmark at all; other stuff we’ve commented on before. Note that the graph they used as “proof” of the excellent solar-T connection turns out to have some problems: see figure 1c of Damon and Laut. Along the way the programme ticked off most of the other obligatory skeptic talking points: even down to Medieval English vineyards and that old favourite, volcanoes emitting more CO2 than humans. It ended with politics, with a segment blaming the lack of African development on the environmental movement. We don’t want to get into the politics, but should point out what the programme didn’t: that Kyoto exempts developing nations. “the 40-70 cooling type period is readily explained, in that the GCMs are quite happy to reproduce it, as largely caused by sulphate aerosols” – this is a v. bold statement – just because something can be modelled does not mean that it is correct – it might be, but not necessarily. It’s very easy to be convinced by modelling, probably because it’s relatively easy to model even extremely complex patterns, after the event – however such models usually break down when asked to predict events. Just take the weather, protein structures or even the stock market as examples – people have being attempting to model these processes for years with relativey little progress. “but if you overlay the full 400/800 kyr of ice core record, you can’t even see the lag because its so small” – I’m sorry, but the lag is either there or it isn’t – you cannot pretend it isn’t there just by squashing up the time axis. I hope you didn’t really mean this – maybe you could try plotting your graph on bigger piece of paper, perhaps! “The correct interpretation of this is well known: that there is a T-CO2 feedback” – “correct interpretation” – this is a subjective statement (and probably an oxymoron) – please give us the facts, your opinions or both, but not your opinions dressed up as facts. I think the people who came up with the oil-slick theory of climate change may yet rank with the most brilliant scientists of our time. I mean men like Velikovsky, Von Daniken, John Mack, and Henry Morris. Men with vision, who strike out boldly into new territory without worrying about what so-called mainstream scientists think. I’d observe that the cooling effects of sulfate aerosols are well-known, are relatively, can go up very quickly (as from a major volcanic eruption), but come down fairly quickly unless somebody keeps generating the aerosols. Ascribing quick cooling directly to war and oil-slicks seems a *real* reach, given normal oceanic temperature inertia (not thermohaline circulation events). in which case, the oil-slick theory would be a typical confounding of correlation & causation. I.e., there may be cooling from periods of intense sulfate production happening due to all-out industrial production, which has certainly occurred during major wars. http://capita.wustl.edu/capita/CapitaReports/EmisTrends/sox2.gif coal production: note peaks around WW I and WWII, and dip during Great Depression. seems at least plausible. The sulfate chart on p157 of Ruddiman’s book is useful. Re #551: Russ Willis — When the ocean warms, more of the disolved carbon dioxide goes into the air. This process requires several centuries to be noticable in the ice core records. But also it has been well known for over a century now that carbon dioxide in the air is a greenhouse gas, heating the air and surface. What has happened for the past 250 years, but most noticably in the past 50, is that fossil carbon has been artifically (that is, by humans) converted into carbon dioxide in the atmosphere. Therefore the climate is now out of balance and is warming. Can anyone tell me what proportion of “man made” CO2 is due to processes that we can do little about (in the short term anyway), such as human and animal respiration (inc. livestock farming)? Is there a breakdown of the sources of CO2 production somewhere – it would certainly be very useful? In other words is the exponential increase in the human global population, which has ~doubled since 1960, a problem or not? Now, methane is an entirely different story. There livestock and rice paddies are quite important. Re #556, 557. Human population is not growing exponentially. In percentage terms, according to Wikipedia the peak growth rate was reached in 1963 at 2.19% per annum (before that, growth had for a long time been superexponential i.e. the percentage increase per year was itself increasing); it has since fallen fairly smoothly to 1.14%. In terms of absolute rate of increase – the arithmetic excess of births over deaths over a given period – the peak was probably reached around 2000, and since then the increase has been sublinear. None of this means population growth is not a problem, but it’s one we have a good handle on. Urbanisation, increasing living standards, improved status and education for women, and better availability of contraception and abortion all appear to contribute to lowering birth rates; and urbanisation, which we couldn’t stop even if we wanted to, is probably the main driver, particularly as it contributes to improved status and education for women, and availability of contraception and abortion.